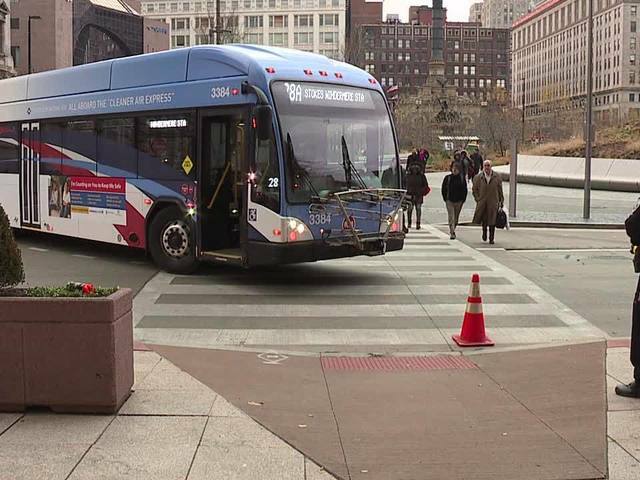 Citizens group Clevelanders for Public Transit believe the closing of Superior Avenue is partly to blame for a December 7 accident involving an RTA bus hitting a 69-year-old woman. Police say the was bus attempting to make a left-hand turn onto Rockwell when it struck Joan Kuendig, while she was a legally crossing pedestrian inside a marked crosswalk. Kuendig was rushed to Metro Health Medical Center with serious head injuries, the cause of the accident still under investigation. "A 69-year-old mother that's in critical condition with a head injury. It's just really disappointing," said Stocking. "The buses going around the square have to make an additional one million turns every year. That's a very high risk for accidents." Transit Union Local 628 President Ron Jackson told News 5 he believes the closing of Superior Avenue has made the square more hazardous for pedestrians, and tougher on the RTA bus drivers he represents. "It's a direct, direct incident as a result of the decision of the Mayor," said Jackson. "I'm really thinking about some kind of job action because our driver is going to get fired. Something is going to happen to that driver. Why? That whole accident never should have happened." News 5 contacted the Cleveland Mayor's office for our story, and we were told the Mayor would not issue a statement until the outcome of the on-going accident investigation. Meanwhile Transit Union President Ron Jackson made a sad prediction after the Dec. 7 bus accident. "It's going to happen again, regrettably it's going to happen again," said Jackson. "And there is only going to be so many times we're going to allow a driver to do that." "Superior Avenue must be reopened."